BlueStone Safety's Level 3a (IIIA) compliant body armor vest is perfect for protection on the go for both civilians and law enforcement. The Tactical Grab and Go is proudly made in the USA using DuPont woven kevlar and is proven to stop handgun projectiles up to a .44 magnum! The Grab and Go body armor vest is extremely versatile; it can easily be stored in a backpack, a computer bag, or a car trunk to provide swift protection at a moment's notice. The Tactical Grab and Go ballistic vest has molle included on the front panel of the vest to allow magazine pouches, handcuff pouches, and other tactical additions. 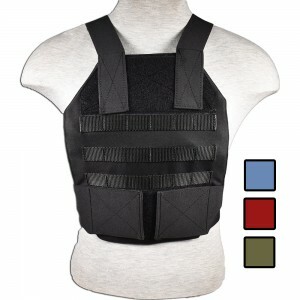 Two sizes are available for the Tactical Grab and Go vest: 11"x14" and 11"x16". The large Tactical Grab and Go is perfect for most adults while the smaller one is great for those who are under 4' 9" tall. Keep protection within reach and get your Tactical Grab and Go Kevlar vest today! Proudly made in the U.S.A.